✔️ PAIN RELIEVER: Clinically-proven, natural and effective device for easing pain without requiring the user to take medicine for problem areas such as the back, joints, neck, knees, shoulders, ankles, legs, wrists, and elbows. Ships with 6 reusable pads for precision placement. Align electrodes exactly how you want. – TWO OUTPUTS – Simultaneous dual output designed for two individuals or two different areas on your body. Whether you use 1 or 2 outputs, all pads will deliver the same intensity. 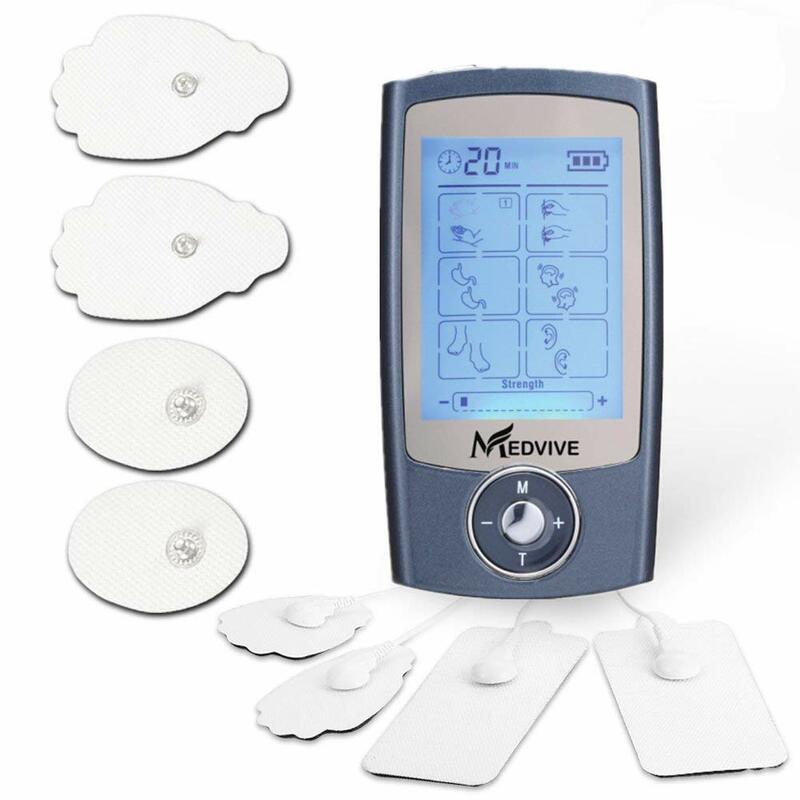 ✔️ FEATURES: – 16 PRE-PROGRAMMED MODES/INTENSITY ADJUSTMENT – Versatile unit delivers 16 different massage modes and 20 strength levels. The modes range from Shiatsu/Deep Tissue to Low Intensity with Kneading/Knocking, Cupping, Acupuncture, and Tapping as other options. – ADJUSTABLE TIMER – Timer allows for usage between 10 and 60 minutes. The time remaining is automatically counted down. – AUTO SHUT-OFF – Device automatically turns off after time finishes and session is completed. ✔️ EASY TO USE: – LARGE ANIMATED LCD SCREEN WITH BACKLIGHT – The animated icons on the LCD screen is easy to understand. The backlight makes it easy to read at night or in the dark. – INSTRUCTIONS MANUAL – Clear product instructions, making the device quick and easy to set up. ✔️ PORTABLE: – CARRY BAG – The device comes with a carrying bag, allowing you to carry it on the go and use when necessary. – POCKET SIZE – This unit is lightweight, small, and durable, and packs enough power to thoroughly massage your body, making it convenient to relax anywhere at any time. – RECHARGEABLE LITHIUM BATTERY – Giving you up to 6 hours of battery life. USB CHARGER – Can be charged at home or on the go. – BATTERY INDICATOR – Marks when battery needs to be recharged. ✔️ FULLY CERTIFIED: This device is fully compliant with FDA standards. Customization:With 16 pre-programmed modes, 20 strength levels, and 2 outputs, this device is versatile and can accommodate every sensitivity level and style of massage desired for pain relief, from deep tissue to low intensity.Natural:The MEDVIVE MV950 Tens Unit provides a natural method of activating endorphins and stimulating the muscle to give you a natural pain regulator. You don’t have to worry about the possible side-effects that come with using drugs for pain relief.